When I was pregnant and learned I was having a boy, one of my biggest apprehensions as a soon-to-be Solo Mom was not how I was going to teach him to pee standing up, the basics of basketball or football, or the conundrum called male sexuality. My worry was how I was going to deal with going to the dreaded barbershop. When it comes to places of grooming, I am a gender-conforming separatist. Men have their barbershops, women have their nail and beauty salons, and if we’re lucky, never shall the two meet. One of my nonguilty pleasures is getting a weekly manicure. Other than the generally inaudible 1990s classics wafting through the salon, it is almost always silent. There is no scrutiny or posturing among the women, as is sometimes the case in the larger world. We are all there, equal in our search for one thing: “me time.” On occasion, our lovely lady pond is infiltrated. In will walk a man, with testosterone on 1,000 and key fob in hand. After surveying the place to determine the length of his wait, he’ll utter, “Pedicure,” as a collective look as if to say, “Who are you?” “Why are you here?” and “When are you leaving?” is served by the women. Many years ago, I had a similar experience when I went to a barbershop with my then boyfriend. It was the land of the communal man cave. There was passing of dark liquor in red plastic cups, blaring hip-hop music competing with a muted television, eyes that lingered too long, language that should never be uttered in the presence of a woman, and endless war stories about “chicks.” My greatest appreciation for the barbershop was knowing I never had to return. Because my life has a perpetual ironic twist to it, I’ve had to go to the barbershop for the past three years. And it was not the shop culture that had me wanting to head for hills, it was my beloved little boy. One of my sister-girls assured me that her son’s barber would be the best person to give my son his first haircut. She described him as nice, patient with kids, skilled at cutting hair, and an all-around good guy. She warned that although often crowded and the wait can be long, it was a civilized shop. She was right. The wait was long, but there was nothing offensive about the shop. There was no deafening music, cursing, or women war stories—just skilled barbers perfecting cuts and satisfied customers walking out. The shop was surprisingly low key—that is, until my son got in the barber’s chair and nearly broke the sound barrier. He squirmed, twisted, and flailed. With each glide of the buzzing clippers, wails of terror tore through the shop. “You’re gonna [sic] have to sit in the chair and hold him,” the barber said, summoning my help. As I sat in the swivel chair bear-hugging my son in my lap, with a bright red cape draped over the both of us catching his falling hair, and my friend struggling to grab hold of his kicking little legs, I told myself there was no way in the world I could deal with this and promised not to return. For the several months that followed, our mornings were much easier. My son’s low-cut “Caesar,” while not the best look on him, required only a quick brushing. As we neared a year with no haircut, his hair turned into a brittle, unshaped Afro. Every afternoon when I picked him up from day care, a beautiful little face sat underneath a smashed postnap Afro. I silently scolded myself for not getting him a much-needed haircut, until one day I could no longer avoid it. A notice in his cubby reminded me that picture day was approaching. Looks of recollection, from both the owner and the barber, descended on us as we walked into the shop. Once again, my sister-girl was right by my side to serve as backup if the same hell broke loose as it had nearly one year before. My hope was that things would go more smoothly, since my son was one year older and, presumably, braver. My friend and I swapped looks of surprise as my son allowed me to pick him up and sit him in the barber chair. We were encouraged as he let the barber drape the pin-striped cape over him. We grew confident when the barber asked him if he was going to be brave, to which he gave a cooperative nod. When the barber flipped the switch on the clippers and that familiar buzz drew closer to my son’s ears, he tried to slide out of the chair. My friend and I double-teamed him, causing us both to erupt in sweat as we tried to restrain him. When he was done, I gladly gave the barber twice his price along with profuse apologies. As we all walked out looking shell-shocked and exhausted, I thought, See you in about a year. As my son’s hair grew, I had to get creative. With some water, leave-in conditioner, and the swirling of a sponge brush around his head like a tornado (hence the brush is called a “tornado brush”), I was able to give him a faux “locs” look—meaning his hair would appear to be dreadlocked although it really wasn’t. This was my hair strategy for him for nearly one-and-a-half years. 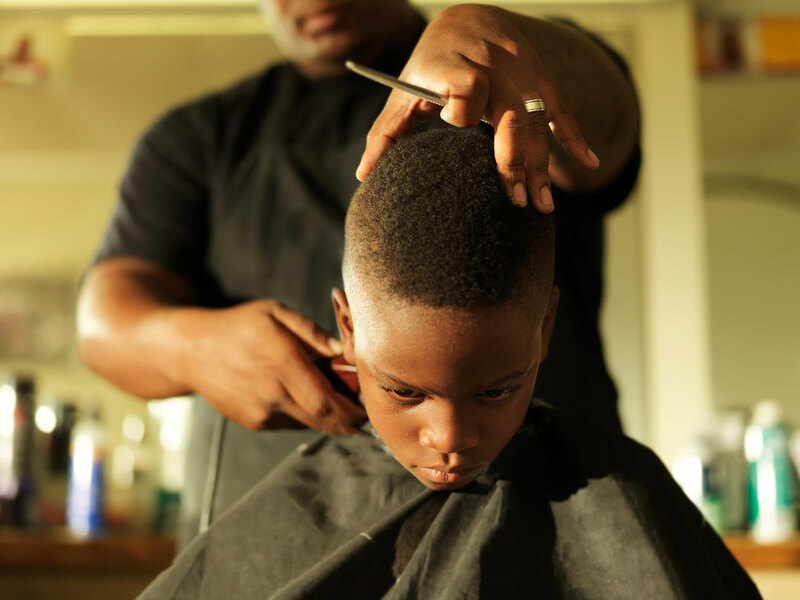 Even when his teachers offered to “loc” his hair as it steadily grew, or friends texted pictures of cuts they thought would look great on my son, I ignored it all. As far as I was concerned, unless they were willing to deal with the haircut histrionics, his hair would grow like Sampson in the Bible before I stepped foot in another shop. When we arrived at the new barbershop, my anxiety was at a combustible level. As I lifted my son onto the chair, quietly begged him to be brave, and reassured him that I and our neighbor friend would not move from his side, he looked at both of us and gave a weak but committed, “OK.” There was some squirming, pleas to cover his ears to block out the sound of the buzzing clippers, and some glassy eyes, but we made it through. In 30 minutes, both my son’s look and level of bravery had transformed from babyish to boyish. For the remainder of that weekend, every time I glanced at my son, admiring how handsome he looked, my heart filled with gratitude for our beautiful village. Albeit small, it is filled with people who love us generously and unconditionally. I know that as a Solo Mom, there will certainly be more that I don’t have the experience or know-how to navigate. What I do have, however, is a committed tribe of folks who are unfailingly there and walking with us every step of the way. For support and connection, check out the variety of Solo Mom Tribes in our Sisters Only section.